We hate to see you go! If there is an unresolved issue you haven't spoken to our team about, be sure to reach out to us by Email or give us a call at 855-ONTRAPORT (855-668-7276). Export any contacts, sales reports, etc. that you want to take with you before canceling. All landing pages, hosted WordPress sites, email links, etc. become inactive immediately. Recovering data from these assets will be impossible after you cancel. Upon deletion, our servers may quickly reclaim the space your account occupied. 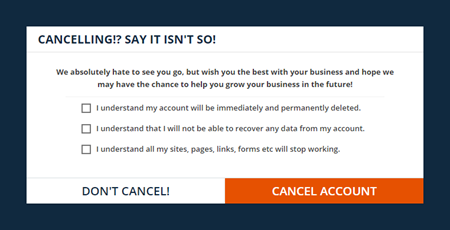 There is no guarantee you will be able to recover any data after you cancel your account. Account restoration may be possible in limited circumstances, but is a manual process and incurs a fee. We cannot guarantee that any of your data will be available for restoration. Generally speaking, account restoration may be possible in whole or in part within 60 days of your cancellation date. We will try our best, but there are absolutely no guarantees that any of your data will be recoverable. You must be logged in as an administrator to cancel your account. Click your login email address at the top right, then click the Account link. On the Account page, locate the Need to Cancel? section in the right column. Read the warning and click the Please close my account completely button. I understand my account will be immediately and permanently deleted. I understand that I will not be able to recover any data from my account. I understand all my sites, pages, links, forms etc will stop working. If you agree and understand, check off each box and click the Cancel Account button. Please take the time to let us know why we could not meet your needs by taking the short cancellation survey. If you signed up with a paid 90-Day Trial Subscription, and cancel within the first 90 days, you may be able to claim a refund by emailing Support or calling Support at 855.668.7276. Please see our Terms of Service under Terminations to see if you qualify. Q. How long do I have to get my contacts after I cancel? A. Your data may disappear immediately. Please export the information you want to keep prior to deleting your account. Q. I have data I cannot export, such as credit card details. How can I get that data before cancellation? A. Contact Support regarding any of the items listed in our Custom Import Services article before canceling. You must obtain the data you want to keep prior to deleting your account. Q. What happens to my landing pages, tracked links and integrated WordPress websites? A. All of your content hosted with ONTRAPORT, including Landing Pages, Tracked Links, links in email messages, etc. will stop working immediately. You will not be able to recover website pages, email messages, sales reports, etc. once you cancel your account. Q. I have my WordPress site hosted with someone else, but integrated with ONTRAPORT using the PilotPress plugin. What happens to my website? A. We recommend disabling and deleting the PilotPress plugin on your website before canceling your account. If your content should remain protected, be sure to implement another method to protect your content immediately after disabling and deleting PilotPress. Content you have protected by PilotPress membership levels will become public as soon as you cancel your account, and your WordPress site may display connection errors when it cannot reach the ONTRAPORT servers. Q. Can I export my email messages and landing page templates? A. No, you cannot export email messages, landing pages, tasks or other content created in ONTRAPORT. You can export Contacts and sales report data found in the Sales collection. Q. 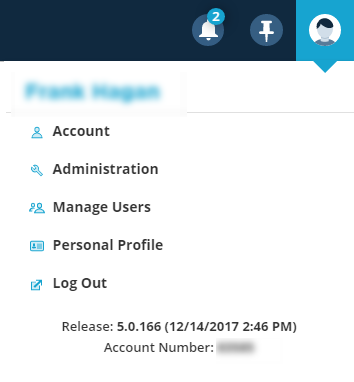 Can I export the notes in my Contact Records? A. Yes, you can export notes. Select the checkbox next to Also export all notes? when exporting Contacts.